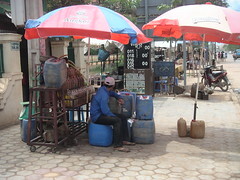 There were only a few western-style gas stations in Siem Reap. Most of them were roadside vendors selling gasoline out of liquor bottles. Your mileage may vary.